Unfortunately, the near-universal appreciation for the musical means that both the price and demand for tickets have kept the show out of reach for many. In the Stateside Presents office in Phoenix, a conversation about Hamilton's wide appreciation and limited accessibility unfolded shortly after the show stopped at ASU's Gammage theatre in 2018. "The couple of people in the office who had seen it were going off about how wonderful [the musical] was, but everyone else was going off about how expensive it was," says David Moroney, who works for Stateside Presents as a talent buyer. "It just kind of started a discussion about how they are using the format for hip hop in a major way, in a major Broadway musical, but that hip hop was created as a music for the people." At Gammage, ticket prices ranged from $80 to $500 a seat. Of course, every Hamilton performance features a lottery, in which winners can pick up tickets for $10. That allows some, though not many, to see the show without shelling out hundreds of dollars. Moroney performs in Phoenix Afrobeat Orchestra with Chanel Bragg, whom he knew to be a dedicated fan of the Hamilton franchise. Bragg is glad of the success of Hamilton, but agrees that the live show isn't available to the people whom the story would mean the most to. "I believe as an artist, as an actress, that it is important to be paid for your artistry. Absolutely! But because of the popularity, it becomes a niche thing," Bragg says. "The only people getting to be a part of it are rich people—which is weird because that's like counter-intuitive to the whole story of [Alexander] Hamilton, who pulled himself up from his bootstraps, was an immigrant with nothing, who made something out of himself. Those are the people who identify with the story, those are the people who can't afford the tickets." And so Moroney, Bragg and Stateside Presents took it upon themselves to give Hamilton fans an opportunity to experience a live performance of the music without the hefty price tag. Don't expect the revue to resemble the original musical too closely. History Has Its Eyes On You–A Hamilton Music Revue features the music—but not the story—of Hamilton. Bragg, who cast the singers and is helping produce the show, said they were careful to cut out any songs that involved too much plot. Plus, many of the songs featured in the revue aren't even a part of the original show. The universe of Hamilton extends far beyond the musical. In December 2016, Hamilton creator Lin Manuel Miranda released The Hamilton Mixtape, featuring deleted songs from the musical alongside different takes on the original music, as performed by various hip hop and R&B artists. A year later, Miranda announced the "Hamildrops" project, which released a Hamilton-related song once a month from December 2017 to December 2018. "Since we felt like all three were valid representations of [Miranda's] vision and wanted to create a program that didn't speak to any one piece but rather was a tribute to the whole vision of everything," Moroney said. "All of my favorite moments in the revue are that juxtaposition between the original cast recording songs and the mixtape stuff." Moroney says the Revue is changing up some of the orchestral backdrop, featuring gritty electric guitar, keyboards and giving the DJs a little more to do than in the original music. And though the Revue isn't putting on the Broadway show, it's still going to feature some Broadway-level talent. Bragg says she's excited to have Eddie Maldonado and Miguel Jackson, who have both been in callbacks for the the Hamilton musical, in the revue. 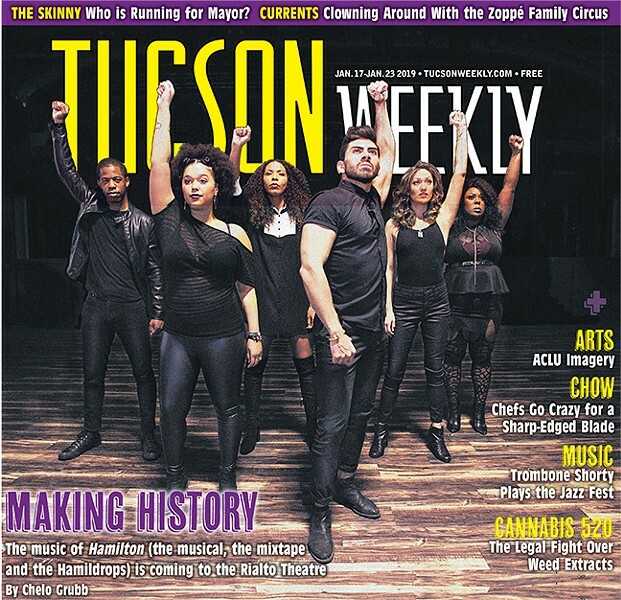 The show also features local performers such as Alex Ncube, who performed in the Book of Mormon national tour; Alyssa Chiarello, who previously starred in Manuel's first musical In the Heights at Phoenix Theatre; and Matravius Avent, who Bragg said did an impressive job tackling Hamilton's fastest and most challenging song. Bragg says the event is a nod to hip hop and Hamilton in equal parts. She's enthusiastic about the possibility of bringing graffiti artists and dance crews into the performance—and, of course, the opportunity to bring Hamilton to people who can't make it to the original show. "I'm excited that this show gives people an opportunity to watch and connect and just have an appreciation for the material in a very informal setting," Bragg said. "It's literally just a fun concert sing-a-long, so people can bring their kids and people in the community can connect with it in a much bigger way than just listening to it on Spotify."